Bakery employees from a Whole Foods Market are shown alongside images of a cake that had a gay slur allegedly written on it at the market. Whole Foods Market said it intends to take legal action against a Texas pastor who claimed the grocery store wrote a gay slur on his custom-ordered cake. Jordan Brown, who is openly gay, said he wanted the words "Love Wins" written on the sweet treat, but discovered an additional word added to his message in bold, blue frosting. In a video, Brown said he contacted an employee at the store, but was told it had not committed any wrongdoing. The grocery chain released a statement in response to what happened. "Our team member wrote 'Love Wins' at the top of the cake as requested by the guest, and that's exactly how the cake was packaged and sold at the store," the statement said. "We stand behind our bakery team member, who is part of the LGBTQ community, and the additional team members from the store who confirmed the cake was decorated with only the message 'Love Wins.'" Upon further investigation into the claim, Whole Foods updated its response saying Brown's "accusations are fraudulent" and it "intends to take legal action against Mr. Brown and his attorney." The market also released surveillance video showing Brown paying for his cake at the register. According to the store, Brown's video shows a UPC label on the bottom and side of the box, but security footage showed the code on the top of the box. Not long after releasing the video on its YouTube Channel, Whole Foods removed it. 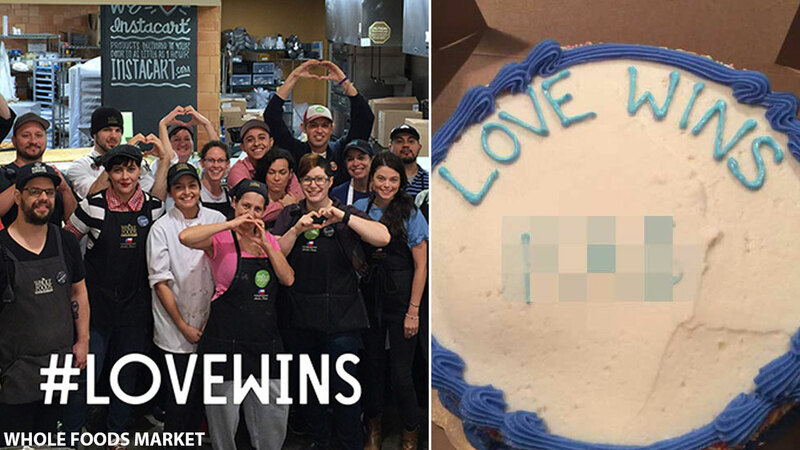 The grocery store also released a photo of its bakery team making hearts with their hands and a caption saying "#LoveWins."